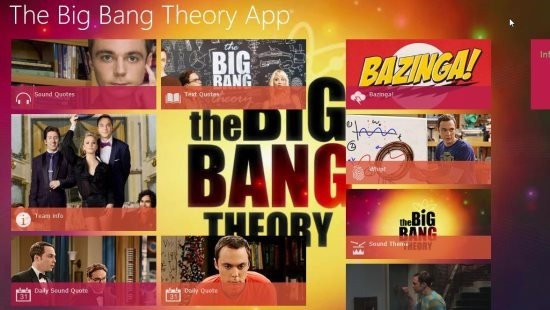 The Big Bang Theory App is a free Windows 8 TV show app. You can view lots of information about Big Bang Theory TV show and other funny features in this app. Yes! I meant the Big Bang Theory TV show and not the boring scientific theory. The Big Bang Theory app is an amazing gift for the Big Bang Theory TV Show fans. You can view info about the cast, quotes, dialogues, text quotes, and much more; using this app. This app download size is 20 MB and needs an internet connection to update on your Windows 8. 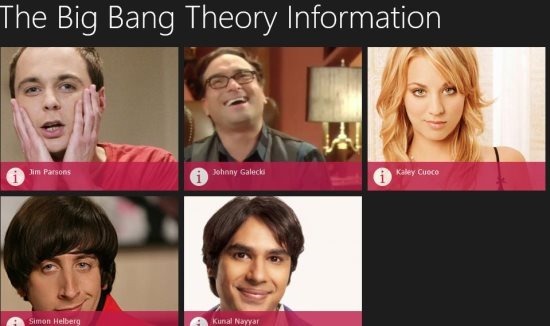 The Big Bang Theory is a good simple Windows 8 TV Show app. You can get complete details of Big Bang theory TV show. You can listen to sound quotes, read text quotes, listen to funny sounds, read details about cast of Big Bang Theory, etc. Let’s see what all this app has in it. The main interface of the app looks like shown in above screenshot. You will see various sections like: sound quotes, text quotes, team info, daily sound quotes, daily quote, bazinga, whip, sound theme, and knock Penny’s door. Sound Quotes: In sound quotes, you can listen to various dialogues from the Big Bang Theory show. Click on the quote that you want to listen. Text Quotes: In text quotes, you can view various text quotes from the TV show. Team Info: In this section, you can view the pictures of the cast. Click on them and you can view the details of the cast. Daily Sound Quotes: In this section, you can view a sound quote from the Big Bang TV show. Bazinga: Click on the screen and the app will shout Bazinga. Whip: This makes a whipping sound. Sound Theme: In this section you can listen to the theme song of the Big Bang Theory; with lyrics. Knock Penny’s Door: This will play the sound track of Cooper knocking Penny’s door. This entertainment app is free. Listen and read various quotes from Big Bang theory TV Show. Play and listen funny sounds from Big bang Theory show. View lyrics and play theme song of Big Bang Theory. Use the app in Snap mode. 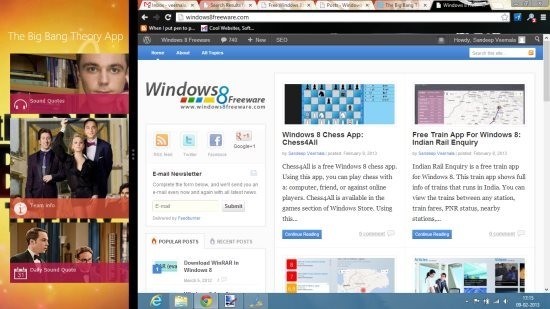 Open this Big Bang Theory App page link in Internet Explorer of Windows 8. From there navigate to the Windows Store and install the app. Also try other interesting apps like: TV show reminder app and Movie theatres app.